This post is the second in a series of posts translating the talk events held at Kyoto Animation and Animation Do’s CTFK 2013 event. This time, I’ve translated the second panel of the day, Futoshi Nishiya’s Free! character design chat! The transcript for this panel is provided by this blogger. Editing support comes from irrevilent. Takemoto: Hello, I’m Takemoto, the guy who was just up here a while ago in the Directors’ Dialogue. For some reason I’m MCing this panel, so I’ll do whatever I can. Sorry for the long opening, so let’s quickly call out our guest. Please welcome Futoshi Nishiya-sensei! Nishiya: It’s a pleasure to be here. Takemoto: Personally, I’m a big fan of your work. The way you draw characters, both male and female, is so sensual. Nishiya: No, no, I could say the same of you. Wasn’t it you who drew Nagisa, Makoto, and Rei on these posters around the room? Nishiya-san, you’ve previously designed a lot of female characters. Free! has a primarily male cast, so what did you pay attention to when designing them? Additionally, could you please tell us who your favorite character is? Takemoto: So please tell us about each of the cast. First let’s start with Haruka, the protagonist. 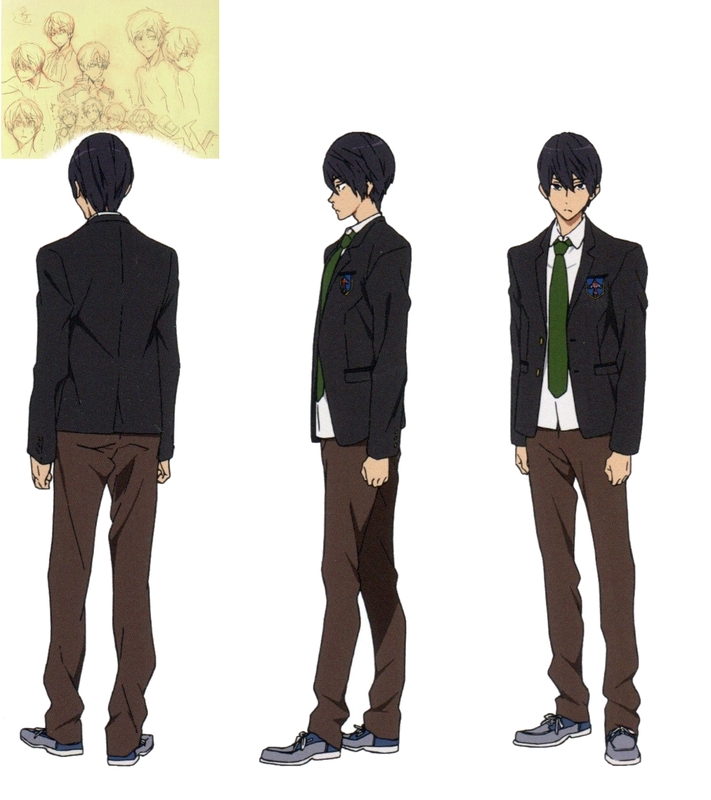 Nishiya: As you can see from Director Utsumi’s prototype in the top left, he was pretty much unchanged. Takemoto: I’ll ask a question about Haruka we received here. I really love the roundness of Haruka’s head, especially when he’s turned sideways. Was this one of the obsessions Director Utsumi had where she asked you to draw it a particular way? Takemoto: A swimsuit that matches an apron… (laughs) Following Haruka we have…. Huh? Takemoto: Right, let’s go back. The screen shows Haruka again. Once again the screen shows Nagisa. Takemoto: Nagisa. Well, do I need to say it? He’s the character you think of after Haruka. So let’s go with Nagisa, in a strictly business sense of course. (laughs) Um…. There’s no questions here about Nagisa. Takemoto That’s really cruel. (laugs) So why don’t you tell us about Nagisa? Nishiya: Nagisa has changed immensely since our prototype. 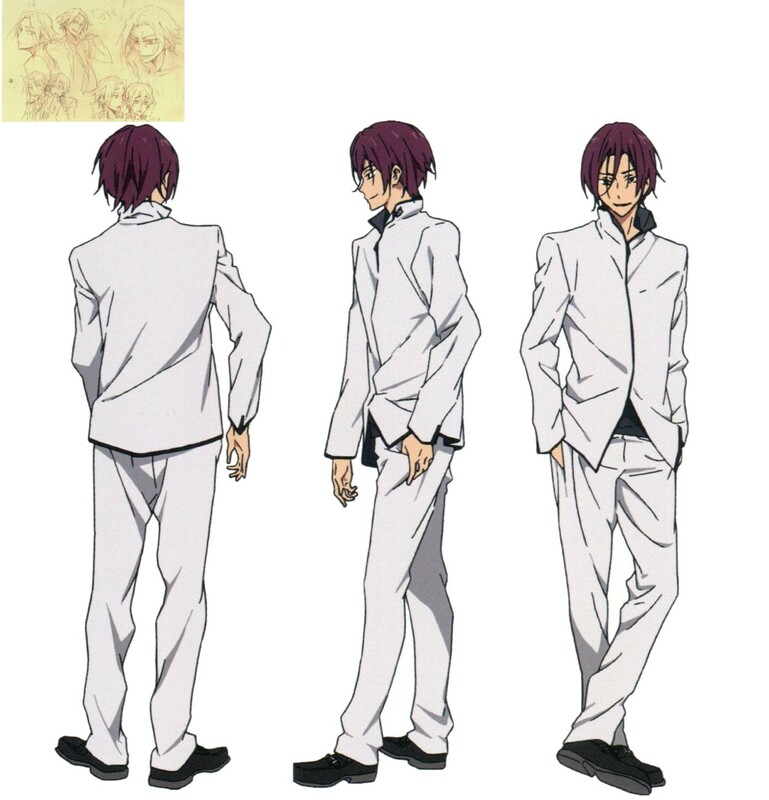 Originally the director wanted Nagisa to be 80% pure and 20% dark, but in the end he ended up being 100% pure. (laughs) If he didn’t do something, then no one else would do anything and the story would be stuck. I had the most fun drawing him. Takemoto: Next we have a question about Rei. 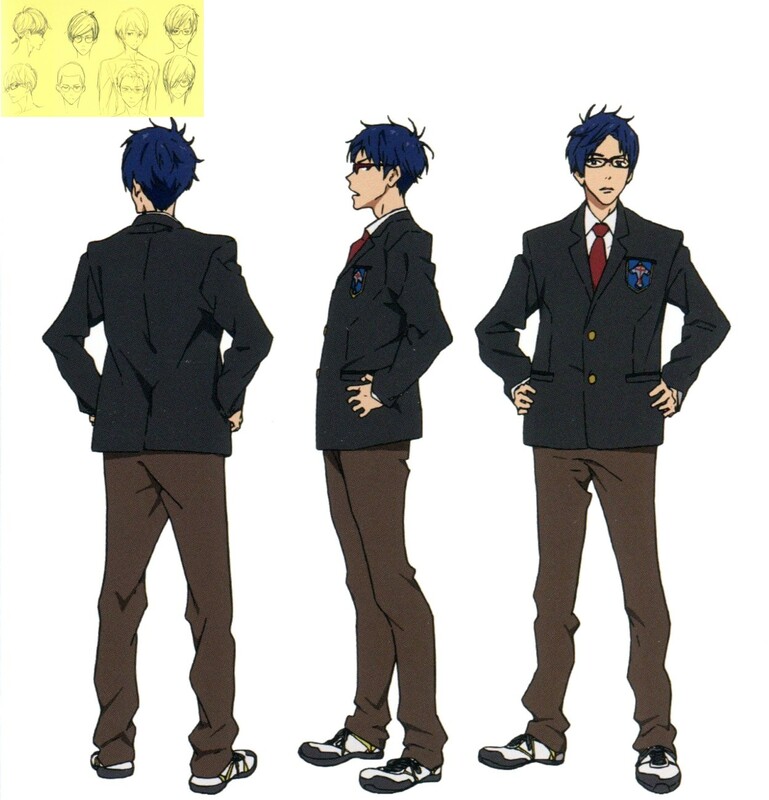 Rei was a completely original character that Nishiya-san designed from scratch, so could he please tell us about any fixations he had when designing Rei. Nishiya: I wanted someone to wear glasses so he was stuck with the glasses. (laughs) Also his hair gave us problems. We could never decide on the right style. Takemoto: Now we have a question from a woman in Osaka about Rin. I love Rin very much, but I was shocked when I saw his characteristic teeth. Why did you include that in his design? Nishiya: Well, as you might guess, he troubled us until the very end. (laughs) With his body looking like this, is it alright for his teeth to look like that? But as I drew him more, I became familiar with them. Also his hairstyle. When I discussed with Director Utsumi about the designs, he had his bangs parted in the middle and we had more or less settled on that, but then the women in the company saw him and commented “something’s lacking.” A lot of women said that about him. (laughs) So we set that to pasture and began from scratch and settled on the bangs you see now. Takemoto: Finally we come to Makoto. Actually, we have a surprise guest here today. Suzuki (in Makoto voice): I’m here everyone! 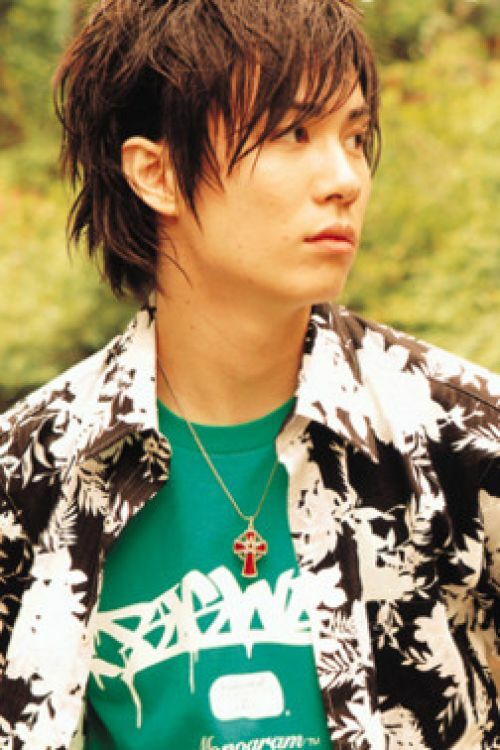 Takemoto: And so this is Tatsuhisa Suzuki, the voice of Makoto. Suzuki: Pleasure to meet you all. I’ve been back there listening to you all give loud receptions. So are all of you out there big Nishiya fans? Suzuki: The passion of Free! fans is amazing. Everyone watches the episodes multiple times. I’ve heard that the first time you soak in everything during that episode, the second time you watch your favorite… sorry, the second time you appreciate the depth of the conversations as you listen, the third time you watch your favorite character, and the fourth time you watch the backgrounds. Suzuki: Only that many? Then if you’ve seen it at least twice! Nearly everyone raises their hand. Nishiya: That’s incredible appreciation for the key animation. Nishiya: Sorry about that. I mistook where we were supposed to meet. Takemoto: And onto Makoto. For some reason we don’t have any Makoto questions either. Suzuki: Really? No one’s interested in him? (smiles) Then I’ll ask something I’ve wanted to know. 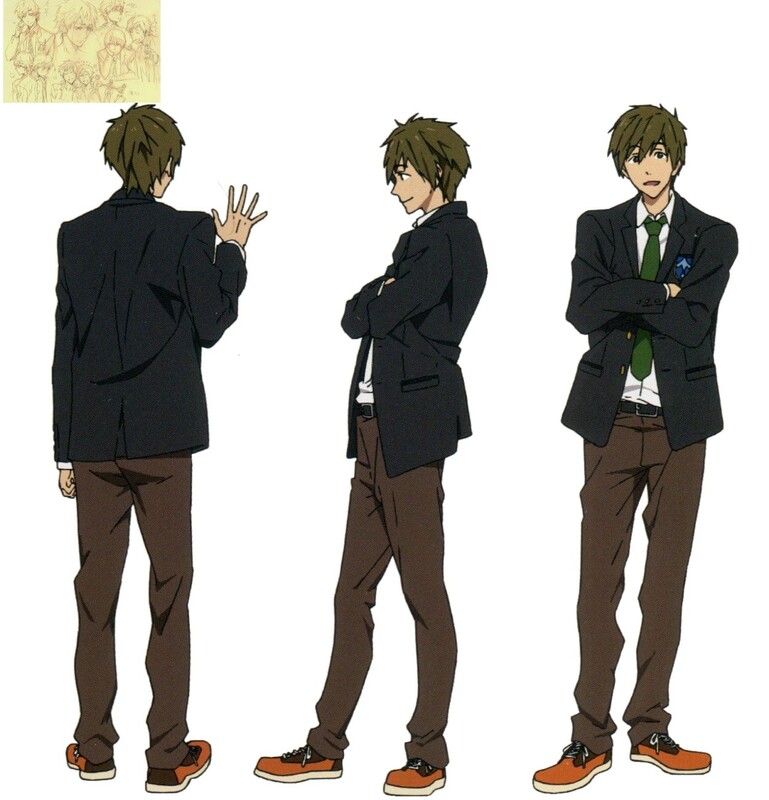 Makoto’s the best looking, isn’t he? What did you keep in mind as you drew him? Nishiya: Makoto’s built well and is tall, so I kept that in mind as I drew him. There’s a nice difference between his body and face. Suzuki: I noticed you also paid attention to his mannerisms too. In the first episode when he’s walking downstairs, he’s a bit bowlegged. That reminds me of how his string tying back his yukata sleeves is slanted. Nishiya: Director Utsumi almost trusts me with the casual clothing. They only need one OK before being used. Suzuki: She’s definitely got fashion sense. What illustration are you most pleased with? You can point it out in this hall if you want. Nishiya: Is it alright for me to say it instead? They begin to talk about the posters of the five swimming that were on display in the hall. Takemoto: Nagisa has it the most difficult… the butterfly and crawl poses are so cool, aren’t they? But the breast stroke… (laughs) When I saw the Kitashima swimmer in motion, he looked so cool, but the images when he paused were so troublesome. It was very troubling to pick out which moment he looked coolest. Suzuki: That image still looks amazing except the shade of water looks a bit off. 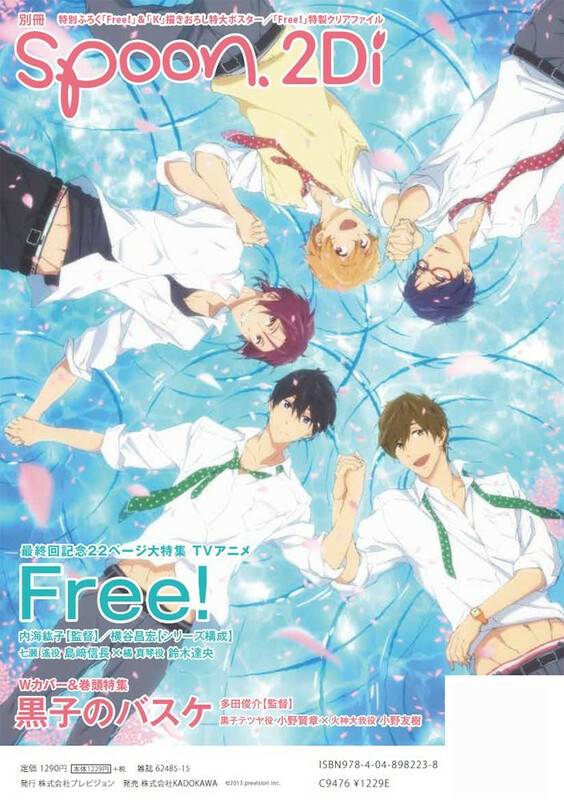 Next is about Free!’s popularity. Suzuki: Free! is really popular. I can’t get my hands on any goods. I wanted to get some goods of the character I play, but I can’t ever buy any when I go to the stores. I also get told by people around me how much they love the show. Suzuki: It’s difficult to get any Free! goods. Oh, one more question from me. Did you do any alterations when putting the show on disc? Nishiya: We didn’t correct anything. Maybe some trivial details. Suzuki: Why would that be? Nishiya: When we delivered the broadcast version, it was already complete so we didn’t need to do any changes. Takemoto: And so our time is nearly up. Before we leave, I have an announcement. High Speed volume 2 has been green-lit. The details will be on the official site at a later date. Takemoto: Now, please give us some final comments. First from Suzuki-san. Suzuki: I’m thankful to be able to talk to you all in a place like this. The broadcasts have ended, but the releases are still coming out, so it’d be great if you could still enjoy the show through those. (Makoto voice) I’ll meet everyone again next summer. 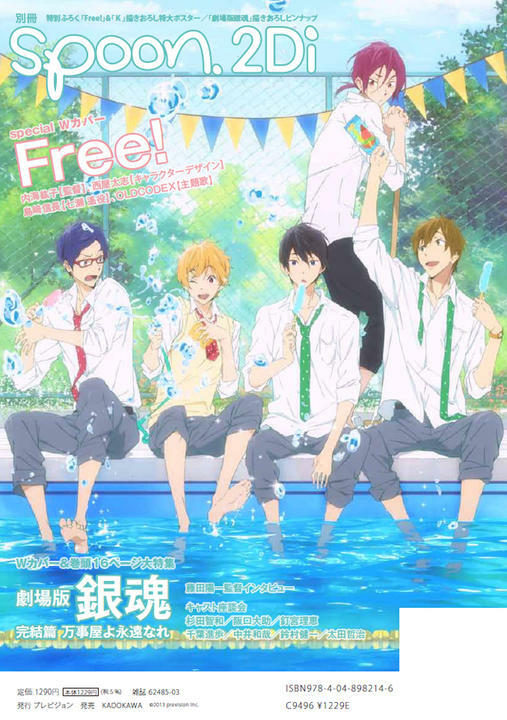 This entry was posted in FREE!, Kyoto Animation, Translations and tagged character design, CTFK 2013, discussion, free!, futoshi, nishiya, suzuki, takemoto, tatsuhisa, yasuhiro. Bookmark the permalink. I wish they said more on Nagisa but at least theres was a nice blurb on Rin, he is my favorite too and his hair style is hot. A season 2 is really likely given video/music disc sales and goods from KyoAni’s own store as well as others. 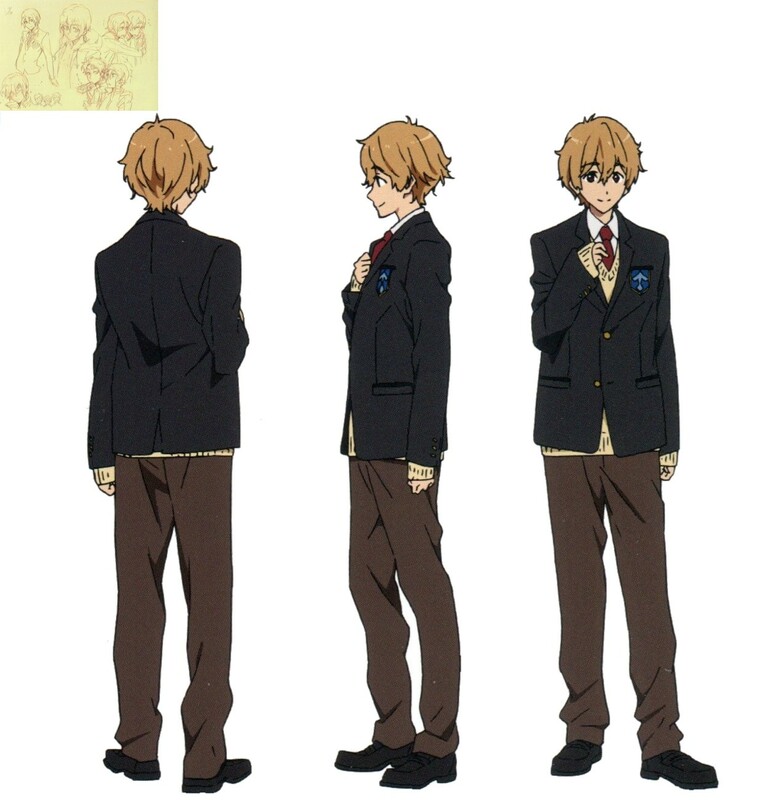 It’s kinda tough to talk about Nagisa’s design; his personality is more dominant as a character.